Away from the madding crowds of Benidorm, the peaceful and charming town of Altea offers plenty of amenities for those who prefer a less frenetic beach holiday, without the glitz, glamour and gusto of the custom-made resorts. Of all the towns on the Costa Blanca, Altea is probably the one that remains the least exploited and overdeveloped; daily life remains largely uninterrupted by tourists and huge hotels have yet to be built. Altea has a long jetty and attractive walkway fronting a calm stretch of shoreline with pebbly beaches encircling the town. The town's central Plaza de la Iglesia leads onto narrow cobblestone streets and offers beautiful Mediterranean views. 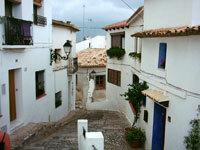 Altea is a pretty coastal town, promising a lovely combination of local culture and seaside activities. Quaint local shops can be found around town. They are mostly open until late in the evening, but closed for siesta in the early afternoon. From Easter until September there is an interesting market in the Altea town square - great for buying local produce and gifts such as embroidered linen, leather goods, pottery and olive oil. The Altea market is open on Tuesdays and has become known as one of the best markets on the Costa Blanca. Visitors wanting a more comprehensive shopping experience should head to either Benidorm or the Sunday market at La Nuncia, just north of Altea. Altea is unusual in that it has more local, paella-style eateries than pubs. The Hotel San Miguel gets good reviews for its food and has great views over the sea. El Castell in the old town serves some of the region's best pizzas, while La Maja is the perfect spot for a cooling cocktail or a stylish Mediterranean dish after a long day at the beach. Altea is home to family-run eateries rather than glitzy, upmarket restaurants, but many visitors consider this part of its charm. Altea is a peaceful place and those in search of a party will likely be disappointed. All the nightlife is in Benidorm, a short trip by bus or car up the coast. Bar Plaza, on Altea's main square, has live music and jazz on summer evenings. Don't miss seeing the church of Nuestra Senora Del Consuelo, famous for its hand-painted blue tiles. Walking and hiking tours into the surrounding mountainous countryside can be arranged in town. There are golf courses both north and south of Altea that accept day visitors. Boat cruises, fishing and scuba diving trips can be arranged in town, while other activities on offer include horse riding, windsurfing and even tennis. Altea is quiet and traditional and not ideal for those wanting a party scene close to town.